NASA's New Horizons mission revolutionized our knowledge of Pluto when it flew past that distant world in July 2015. Among its many discoveries were images of strange formations resembling giant knife blades of ice, whose origin had remained a mystery. Now, scientists have turned up a fascinating explanation for this "bladed terrain": the structures are made almost entirely of methane ice, and likely formed as a specific kind of erosion wore away their surfaces, leaving dramatic crests and sharp divides. These jagged geological ridges are found at the highest altitudes on Pluto's surface, near its equator, and can soar many hundreds of feet into the sky – as high as a New York City skyscraper. They are one of the most puzzling feature types on Pluto, and it now appears the blades are related to Pluto's complex climate and geological history. 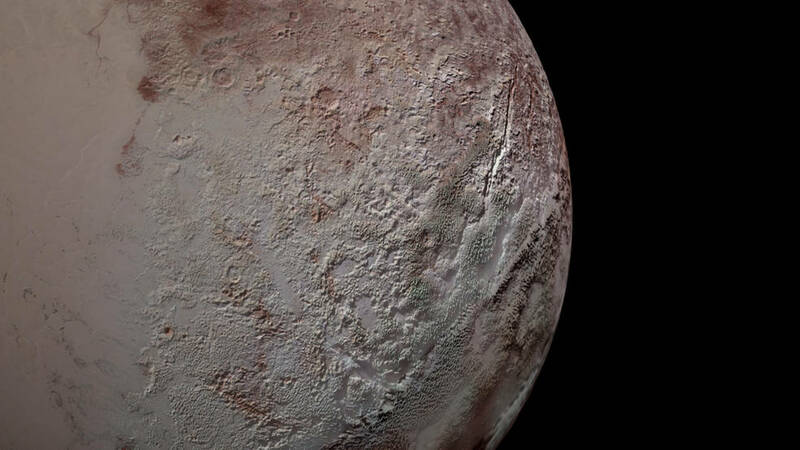 A team led by New Horizons team member Jeffrey Moore, a research scientist at NASA's Ames Research Center in California's Silicon Valley, has determined that formation of the bladed terrain begins with methane freezing out of the atmosphere at extreme altitudes on Pluto, in the same way frost freezes on the ground on Earth, or even in your freezer. "When we realized that bladed terrain consists of tall deposits of methane ice, we asked ourselves why it forms all of these ridges, as opposed to just being big blobs of ice on the ground," said Moore. "It turns out that Pluto undergoes climate variation and sometimes, when Pluto is a little warmer, the methane ice begins to basically ‘evaporate' away." Scientists use the term "sublimation" for this process where ice transforms directly into gas, skipping over the intermediate liquid form. Similar structures can be found in high-altitude snowfields along Earth's equator, though on a very different scale than the blades on Pluto. The terrestrial structures, called penitentes, are snow formations just a few meters high, with striking similarities to the vastly larger bladed terrain on Pluto. Their spiky texture also forms through sublimation. This erosion of Pluto's bladed terrain indicates that its climate has undergone changes over long periods of time – on a scale of millions of years – that cause this ongoing geological activity. Early climatic conditions allowed methane to freeze out onto high elevation surfaces, but, as time progressed, these conditions changed, causing the ice to "burn off" into a gas. As a result of this discovery, we now know that the surface and air of Pluto are apparently far more dynamic than previously thought. The results have just been published in Icarus, an international journal of planetary science. Identifying the nature of the exotic bladed terrain also brings us a step closer to understanding the global topography of Pluto. The New Horizons spacecraft provided spectacular, high-resolution data about one side of Pluto, called the encounter hemisphere, and observed the other side of Pluto at lower resolution. Since methane has now been linked to high elevations, researchers can use data that indicates where methane is present around Pluto's globe to infer which locations are at higher altitudes. 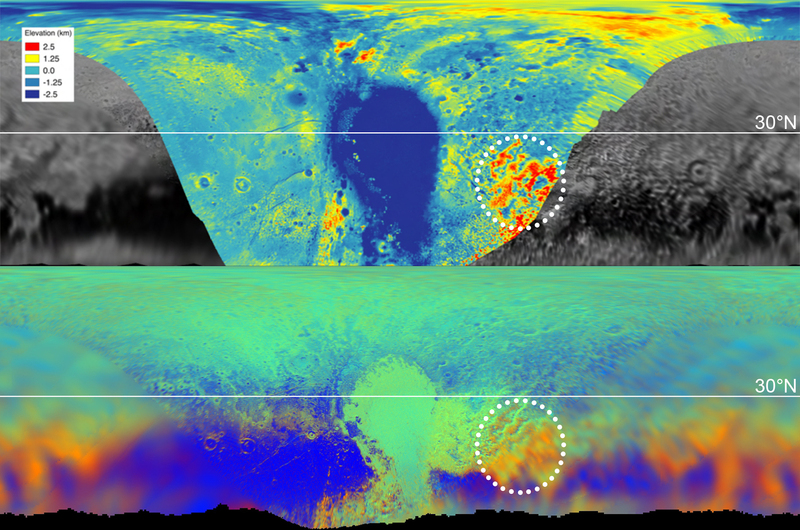 This provides an opportunity to map out altitudes of some parts of Pluto's surface not captured in high resolution, where bladed terrains also appear to exist. Though the detailed coverage of Pluto's bladed terrain covers only a small area, NASA researchers and their collaborators have been able to conclude from several types of data that these sharp ridges may be a widespread feature on Pluto's so-called "far side", helping to develop a working understanding of Pluto's global geography, its present and its past.